In a different thread, the idea came up to have an AFOL meeting in London. We were thinking about meeting an evening or afternoon somewhere close to Westfield Shepherd's Bush or Westfield Stratford for obvious reasons, then retire to a pub or restaurant. 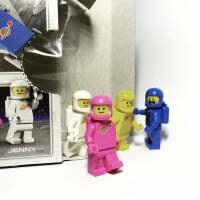 We could drool over latest finds in grab bags, trade bricks or polybags, just talk, have an impromptu MOC session, etc. etc. I will create a doodle poll later on, but for now it would be great to know who's interested and what days of the week it would work best (Friday/weekends, or during the week?). I somewhat loosely suggest mid-June as date. I'd prefer to avoid Mondays and Tuesdays, but could probably work something out if necessary. Ok for weekends in principle but it would depend on the exact date. Yeah I am the same tuesday to friday is difficult but can do saturday or sunday with enough notice. Weekends are easiest but I can scam time off work for essentials like this :O) My preference is for Stratford purely for the friendliness of staff, but happy to go to either. ^ I could do 2nd June! What is the age bracket for an AFOL? I'd love to come along but I think I'd feel like an outcast if you all turn out to be a couple of decades older than me. Im 24 but talking on the internet i dont feel young so should be fine in person. 2nd June is okay with me. I am also interested, but more difficult at a weekend (given I have to come into town all week, and family might not welcome me heading off again at the w/e). So my preference would be a weekday afternoon / early evening to grab some - well, grab bags - and then a beer / bite to eat somewhere. I work near St Paul's so access to Stratford or Shepherd's Bush pretty straightforward (if the Central Line's working!). It'd be easy enough for me to knock off a little early on the right day, but appeciate others will be coming further though and may not have the flexibility. What time do the Lego Stores stay open until during the week? I'm in. I'm on holiday from work most of june, however couldn't make it the days england are playing. Or the day after come to think of it! I am in. Mid June should be fine with me. Ok, I reduced the options a bit to keep things simple. I'm a fan of simple doodle polls, and we can always change things for a followup meeting. In the spirit of keeping the number of options down, let's simply go to Shepherd's Bush. I believe it's a slightly bigger Lego store and might be easier to get to. Also, there are lots of venues for a drink afterwards. We can go to Stratford next time. We'll decide on an exact meeting spot once we have confirmed a date. We can meet at the Lego store or, maybe more comfortably, in a cafe. 24 May, 25 May, 26 May, 27 May, 14 June, 15 June, 16 June, 17 June. My apologies in advance to anybody for which none of the dates fit. I am sure that we will have more meetings in the future, and I'm more than happy to alternate days, locations, etc. P.S. : I didn't pay attention to the category when I started this thread. Can somebody with enough access please change it to "Community and Events"? Super organisation and decision making there, @mressin! Actually I now concur on Shep Bush; it is a weeny bit bigger and it is MUCH less crowded! I met a couple of London AFOLs at AFOLCon who are not Bricksetters (I don't think so anyway) - Julian and Drew - any objections to me inviting them? ^ only if you convert them to Bricksetters! Drew, Silent Mode, uses the main site but not the forum, AFAICT. Hi, I'm the Julian that caperberry mentioned. Sounds good to me! I'm definitely in. Pretty flexible on dates as well. Heres that link again ... come on folks, fill in when youre free..
Let's wait one or two more days, then I'll close the doodle poll and we'll see. June is definitely looking more suitable at a glance. Will be in for this when you go to Stratford, but not Shepherds Bush. Firstly Shepherds Bush is more out of my way (especially at a weekend). And secondly I have never had a single good experience in Shepherds Bush store, in total contradiction to the Stratford one. Either store is fine for me as they would take roughly the same amount of time to get to from where I live. Stratford is definitely friendlier, but Shepherds Bush generally has the better grab bags (if they're available). I have had nothing but great experiences at Shepherds Bush! I have found the staff friendly and helpful, and always say hello! They're nice enough at Shep Bush and some of them are really great; you just need to break the ice really, which isn't always easy (but will be easy when there are lots of us!). I think they are dulled down by the clientele there, who are apparently very "no i DON'T need help, I just want two Death Stars for my 4 year old"
So did everyone see the link to say what days you could do? Looks like Thurs 14th June is the best day so far .. @LeGirl and @LuckyRuss, any way you could squeeze to the Thursday then we could have a full house? Either's fine for me, but I prefer Shep Bush as its a bit quicker to get to, plus it doesnt involve any tube travel, plus the general ambience of the mall is better, especially the restaurants. I can't do this as have a team meeting in Bradford of all places and couldnt get the day off. Hope everybody has a great time! I've closed the poll. Looks like Thursday 14 June it is (14 votes). My suggestion is to start meeting at 7 PM at a nearby café. There is a Starbucks just upstairs from the Lego store in Shepherd's Bush, alternatively there is a café called "Ca-puccino" near the entrance. Let me know what you think. Looking forward to 14 June. Sounds great! FYI, I could be there by 6.30 if anyone else wants to meet earlier. We can meet earlier, I'm pretty flexible myself. We just need to be careful not to deter all those who can't come early. I vote for Ca-puccino (or any other non-Starbucks cafe!) and expect I'll be there between 6.30 and 7. Perhaps if someone is going there on 3 June, they could forewarn the manager? Sounds like grab bags may be popular! Good idea about warning the manager. I might go today for the Hulk minifig. In any way, I'll give them a heads up. Excellent. Can be there for around 6.30. Looking forward to it. Don't honestly think I will be able to make this one (but maybe), but just wondering if you guys/gals had considered doing a parts draft, judging by the sharing of parts in the brick bags at AFOLcon and the idea of splitting grab bags I would think that this type of meet would be ideal to do a draft. Thoughts? I'm not sure I understand what exactly you mean by "parts draft". Is that similar to "secret santa"? In any way, yeah, we should do whatever AFOLs would do at such a get-together and if desired why not exchange bricks as well as stories! A parts draft is where everyone buys a set that is on a big discount, then all the sets are opened and people go around taking turns to choose parts they want. That way, everyone ends up with their most desirable elements. That sounds fun. Maybe we can all put an equal amount into a kitty to buy sets? If we get a couple of fun houses then everyone can get a minifig too! Looks like I will have to try to make the Thurs. On a normal day 6.30 would be great, but I think I'm in Leeds although might be able to get back. In general though anything involving purchasing huge quantities of bricks and then sharing them out sounds cool. I'll have to confirm nearer the time.